This topic contains the history updates. Again. 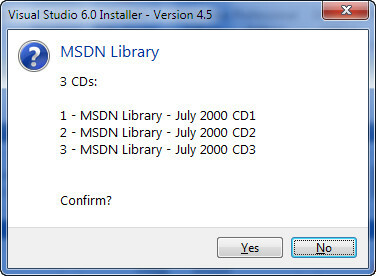 In some cases did not identify correctly the CD structure of MSDN 98. (*) It could be that some files and folders are common in all the CDs, so at the time of the copy will be asked whether to overwrite them. Always answer yes. 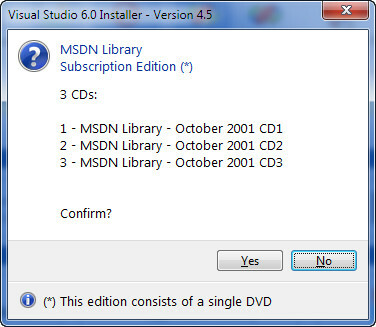 a) unzip the en_msdn_library_october2001_dvd.exe into a new folder you want. If you use 7zip, simply right-click the file and choose the menu command: Extract in "en_msdn_library_october2001_dvd\"
Simply click the Install MSDN Library button to start setup. If you receive a error, now you can press Continue button to however run the Visual Basic 6.0 setup. This icon open the help file related on current tab. On some cases, VS6I was not able to retrieve the correct path for shared components, which should be: \Common\Tools\VB. Please read Windows 10 issue! 2.CHANGE: Permissions to access Registry. VS6I no longer displays the error message when the user does not have permission to access the Registry to provide the ability to install the old components (AniBtn32.ocx, DBGrid32.ocx, etc.) In the group Shared components. Simply, now disables the group. In some editions simply you will create a zero-length file, in others it is necessary to copy the original file; also, it all depends on the version of Windows. 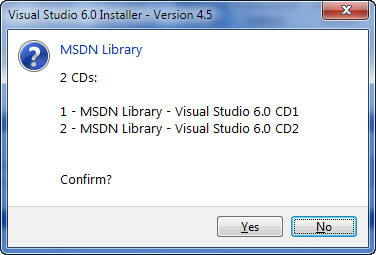 You do not have to worry about what need in your edition of VS6/VB6: VS6I thinks of everything! Before to run VS6/VB6 setup please read Windows 10 instruction. 6.CHANGE: Crystal Report 4.6 installation. Tested with Italian edition only. For other languages: if you encounter problems you may contact me via forum. The installation of Visual Basic does not create any link; This command allows you to create a link to the Desktop and Quick Launch bar. If link already exists do nothing, but shows a warning. 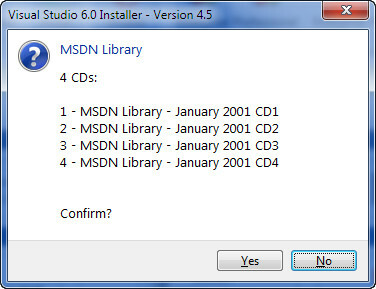 5.Fixed: In the English version of the MSDN CD1, the structure of folders and files may be different with other versions; the result is that when start to prepare the 2MSDN60 folder you receive a error File not found. 1.Change - Fixed recognition of Service Pack 6. 1.Change - Fixed state recognition of existing prepared-folders (Install buttons) after set the ROOT folder. 2.Change - Fixed error to recognize Service Pack prepared folder. 3.Change - Some minor changes. 3.Info - the SP6 must be unpacked into a folder, before to prepare SP6 folder.